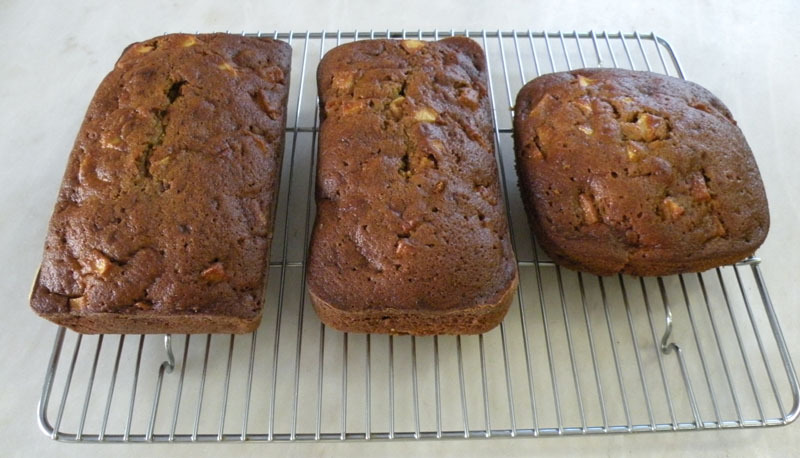 This pumpkin apple bread is a new addition to the list of my family’s favorites. It is baked in an 8 x 4 in loaf pan and one batch yields 3 loaves. It freezes well and makes a lovely gift when wrapped in plastic and tied with gingham bows in shades of orange and green. It males a wonderful addition to a Thanksgiving dessert buffet or it can be saved and served the morning after Thanksgiving with a steaming hot cup of coffee and a splash of milk. The melded flavors of fresh apples, pumpkin, cinnamon and walnuts in this bread encapsulate autumn. Give it a try and let me know what you think. Combine flour, baking soda, cinnamon and salt in a large bowl with a whisk and set aside .In a large mixing bowl combine sugar, pumpkin, eggs, oil, and water and beat just until the mixture is well blended. Fold pumpkin mixture to the dry ingredients with a plastic spatula until moistened then fold in apples. Scrape batter into prepared pans. Bake at 350° F for 60 – 70 minutes. The loaves are done when a wooden pick inserted into the center of the loaf comes out clean. Cool for 10 minutes and then invert on wire rack to cool completely. Note: If you are planning to bake these delicious loaves for the holidays freeze the loaves immediately after they cool. Wrap them in plastic wrap and then in a layer of aluminum foil and freeze. Before gift giving remove the outer layer of aluminum foil and tie ribbons around the loaves or package them in cookie boxes with holiday colored paper tied with ribbon.